1. Be ready and download the shopping app. Readiness is your best bet to great deals. Keep up with the action so you can get a preview of the best buys. Do this anytime, anywhere, at the convenience of your fingertips with the Lazada mobile app. Whether they are must-haves or good-to-haves, log them down in the Wishlist function on your app. You get up-to-the-minute alerts on the best deals for the products you’ve picked and even get rewarded with massive savings. Loading your shopping cart hours before 11.11 frees you up to browse through more items and hunt down the best deals. When midnight strikes, all you have to do is click the checkout button and you're good to go. No credit or debit cards? Not in the mood to sign-up for an e-wallet? Worry no more since with Lazada you can pay via cash on delivery. Order the item you want, wait for it to get delivered and pay with cash. It’s that easy! Be the first to grab the deals that drop at 12 midnight on November 11 and be logged on throughout the day to look out for millions of deals. Stand out in any crowd by picking up items from Lazada’s specially curated Taobao Collection, handpicked from the world’s biggest online marketplace that is owned by Alibaba. Millions of products, ranging from popular fashion clothing brands to beauty tools, are on offer. Aside from heavily discounted items on the website, take advantage of onsite and partner vouchers. You'll never know, that jaw-dropping deal may have an additional discount on top of the current sale price. There are some deals you can only get on Lazada. Whether it may be a special price offer, product bundle or an online exclusive, don’t forget to always be on the lookout. It might be the best Christmas gift yet. Lazada also offers free shipping services. For Metro Manila orders, shipping is free and for all other areas, you simply have to reach a minimum purchase requirement for free delivery. Forget about the traffic, parking and gasoline – sit back, relax and shop! 7 in 10 shoppers use smartphones to shop on Lazada. So you can trust that Lazada has made buying and checkout experience as smooth and hassle-free as possible. So even as you are on the move, you can still browse, tap and buy. 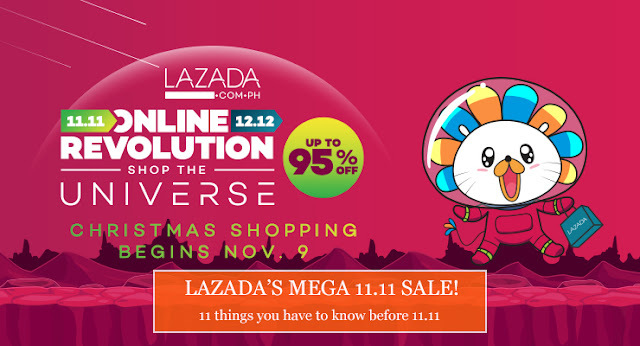 If you miss out on an 11.11 deal, you can still get the best deals since Lazada’s Online Revolution sale is a month-long event. Mark your calendars for the last leg of their sale on December 7 to 12. Watch out for more Flash Sale schedules and Announcements!